Concrete is the traditional material used for driveways but it is not always the best option. Not only does concrete stain easily, it can also crack, and sometimes a complete replacement is required if it is damaged. A paved driveway is a good alternative to concrete, offering a number of advantages to the homeowner. Most people think that concrete is the only option for a long lasting driveway. However, paving stones are just as durable. They can handle all the heavy use a driveway is exposed to, including the weight of vehicles, without cracking or becoming damaged. 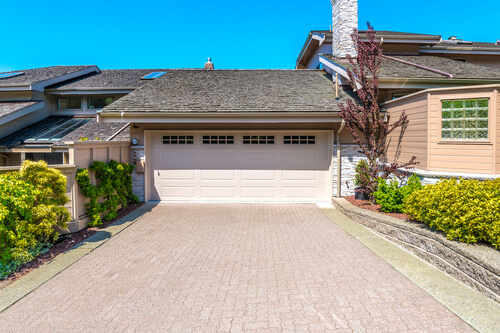 Driveways are susceptible to staining from spills, oil leaks and rubber burns. So what’s the good news? If you pave your driveway and seal it with a high quality paver sealer, you can prevent stains and easily wash away any marks with water. When a concrete driveway because damaged, you can repair the area (which results in patchiness and an uneven colour), or replace the whole driveway. Neither are great solutions. However, a damaged paver can be replaced quickly and easily without complicated tools or hours of labour. In fact, it’s a job you can easily do yourself! Pavers come in a variety of colours, as well as a range of shapes and patterns. This means you can select pavers to complement the colour and design of your house. Some of our clients also like to have us shape their pavers into fun shapes and designs. For example, we recently completed a driveway for a family where we paved their initials into the driveway! Research also shows that the visual appeal of a paved driveway also adds value to your home and will make your home sell quicker. Sound good? Call Just Pave today to find out more. We pave driveways in Launceston and all surrounding areas.